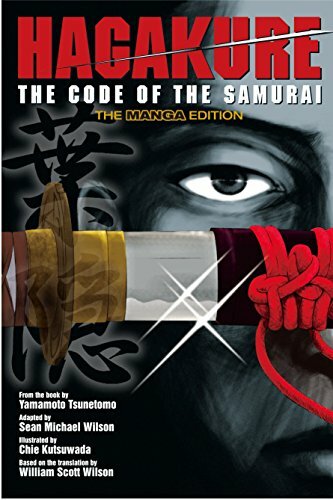 Based on William Scott Wilson's definitive translation, adapted by scriptwriter and comic book/manga author Sean Wilson, and with lively drawings by well-known illustrator Chie Kutsuwada, this first-ever graphic treatment of what's considered the most influential of all samurai treatises is sure to delight manga fans, martial arts enthusiasts, and students of Japanese culture. Reminiscent of The Arabian Nights in structure, Hagakure is a collection of tales and anecdotes that offer instruction and insight into the philosophy and code of behavior that foster the true spirit of Bushido – the Way of the Warrior. A young, upcoming samurai seeks the advice of an older, seasoned warrior who has become a Zen monk. The ambitious young samurai humbly begs to learn from the old master, who consents. So begins a series of eventful meetings. At each sitting. the master tells his young student tales of samurai past. Tales of famous warriors are recited, as well as ignoble gaffs. With brutal, unrelenting samurai justice, wrongs are righted and judgment is enacted. With each incident, the young novice learns what it means to be a samurai. Learns what courage and right thought are. Learns the harsh realities and subtle wisdom of his age. Writer Sean Wilson and illustrator Chie Kutsuwada both bring ample experience in the genre to this project. And, as an added bonus, William Scott Wilson, the translator of the original Kodansha International version of the book, provides an illuminating Afterword. If you have any questions about this product by Yamamoto Tsunetomo, contact us by completing and submitting the form below. If you are looking for a specif part number, please include it with your message.